Twenty-four million Americans suffer from diabetes, and one in three children are overweight or obese. Studies show that poor diet and physical inactivity are poised to overtake tobacco as the leading actual cause of death in the US. 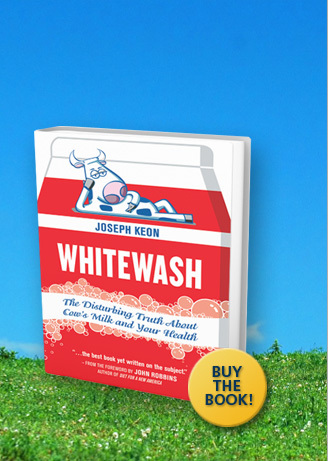 In Whitewash, Joseph Keon unveils how North Americans unwittingly sabotage their health every day by drinking milk, and shows that our obsession with calcium is unwarranted. I might be one of the last people you would expect to find questioning the value of dairy products for human health. Not that this is an easy question for most people. The assumption that dairy products are wonderful foods prevails throughout our culture with amazing tenacity. But in my family of origin, this assumption was held with a steadfastness that was virtually religious. Whitewash is published by New Society Publishers, an activist publisher focused on solutions and social change. Using the most sensitive and rapid testing technology, researchers lead by Dr.